Hey Arsenal Crew! How on earth is it already December 7th? I honestly feel like we were just sweating bullets outside for every workout, and now we are praying that the workout doesn’t involve running in cold air and causing asthma attacks! What doesn’t kill you makes you stronger right? 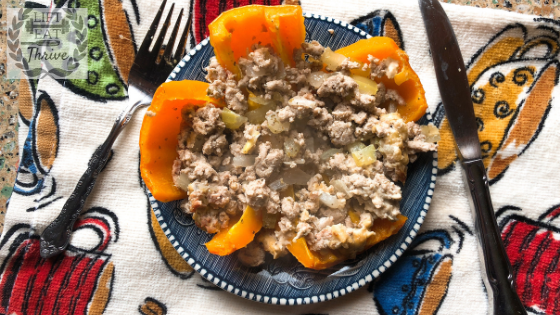 I’ll tell you, though, these stuffed peppers with make you feel whole again. That’s a promise. When you make these, I hope you take the time to slow down and breathe. Before you begin, disconnect from the technology and reconnect with the process of preparing nourishing foods. Sometimes, the hustle of everyday life, combined with the frenzy of the holiday season, increases a baseline anxiety. Don’t get me wrong. The season is full of wonderful love and togetherness, but I think we need to consciously press pause and enjoy that fellowship. It is gone the blink of an eye! Consider this recipe a personal invitation to consider the amazing things your body can do, how far you have come this year, and what more you will accomplish in the future. Because there are several steps (chopping, sautéing, and baking), you will have many opportunities for reflection! What are you reflecting on this year? Did you travel? Make some incredible PRs? Graduate from school? Start CrossFit? Move to Pittsburgh? After you make this delicious meal, share your thoughts in the comments here on the blog or over on our Instagram! Use the entire mixture and make 4-5 stuffed peppers. Prepare peppers so they are ready to be filled with goodness. Over medium heat, add ghee to large sauté pan and cook onions until translucent. Add ground turkey and mix thoroughly with the onions. Add the vinegar, seasonings, and celery and combine well. Cover with lid and allow to simmer for 5 minutes. Scoop contents from the pan into the peppers. Top each pepper with a TBSP of baba ghanoush. This will create a creamy crust on top! Bake for 25-30 minutes, monitoring for a little browning of the baba. Enjoy! For more recipes, workouts, and lifestyle content, head on over to @lift.eat.thrive on Instagram!